By Amy Hall, Tom Anderson & Eliza Egret. First published in the Canadian magazine Briarpatch. Yousef,* Samih,* and Hasan* are exhausted. Their eyes are heavy and Samih is slumped in his chair. It’s after 10 p.m. and the 14-, 15-, and 16-year-old need to get up for work in less than six hours. The three Palestinian teenagers work together in the fields of a capsicum and chili pepper farm, in the illegal Israeli settlement of Tomer, West Bank. The West Bank, which is part of Palestine, has been militarily occupied since Israel invaded in 1967. Every day the boys start work at 5:30 a.m., harvesting peppers to be packed and sold across Israel, the West Bank, and elsewhere in the world. Most of their fellow workers are teenagers like them, some child labourers as young as 13 years old. Despite the hard, physical work – and their young age – they say they are not allowed any breaks during the day – not even to go to the toilet or get a drink. “We go to the toilet before we go to work. If they catch us going in the farm they will punish us,” says Yousef. “We breathe in the chemicals. It’s toxic. They use plastic over the farm, so it’s enclosed. We feel it in our eyes,” says Yousef. They are not provided with drinking water, so they have to drink the water from the same hose line that is used on the capsicum plants. They are worried that this may also be polluted with chemicals. “I almost cut my finger off while working because of the cutters they give us. The settlers don’t give us days off when we’re sick or injured and my finger was hurting for 10 days. They didn’t give me any medical help,” says Hasan. Most of their fellow workers are teenagers like them, some child labourers as young as 13 years old. Khaled* joins the interview. He is the oldest worker we speak to, at 18 years old. He works in a capsicum and chili pepper packing house in Tomer. He has been there for two years – although he adds that to him it feels more like a hundred. In the factory, Khaled stands in a long row with other workers and uses a machine to wash, clean, divide, and box up the capsicums. He doesn’t know exactly where the peppers are being sent, but knows that some are going to Israel, some to elsewhere in the West Bank, and some to Europe. The boys are just some of the 1,800 Palestinian workers labouring on Israeli settlements in the Jordan Valley. The land on which these settlements were established was taken from Palestinians; the majority of it was private land owned by individual farmers. Yousef, Samih, and Hasan all live nearby, in the tiny village of Fasayil. Fasayil has had hundreds of acres of land stolen by the occupation. Over 7 per cent of the village area has been taken by the Israeli government to build four settlements: Tomer, Gilgal, Petza’el, and Netiv HaGdud. 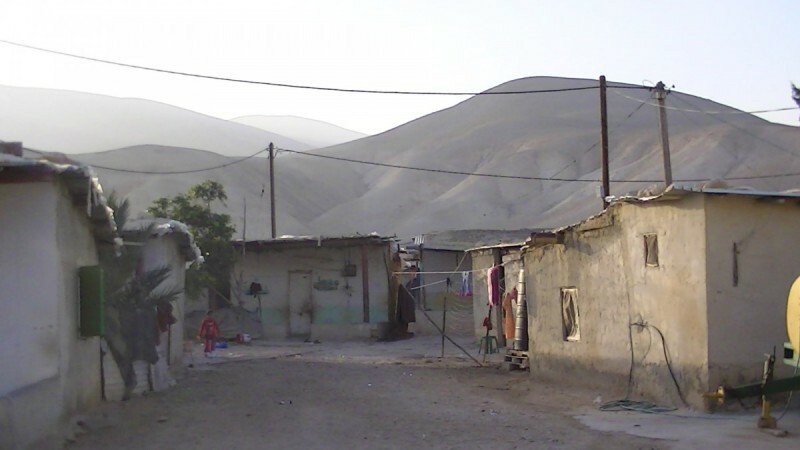 Illegal under international law, these settlements and others like them have brought around 11,000 settlers to the Jordan Valley. Almost 90 per cent of the Jordan Valley has been designated Area C – West Bank land that is under full Israeli control. Virtually all Palestinian construction in Area C is banned by the Israeli authorities, for any purpose, including housing and infrastructure. The Jordan Valley is used as a military training area by Israel – about 46 per cent of its area has been declared a closed military zone. Groups of soldiers can be seen lurking in the hills as they carry out military exercises, and Palestinian homes, farms, and water supplies are regularly destroyed by the military. Villages are declared military firing zones, with residents forced to evacuate their homes on little to no notice. People live under constant surveillance, under the gaze of an increasing number of cameras stationed along roadsides. 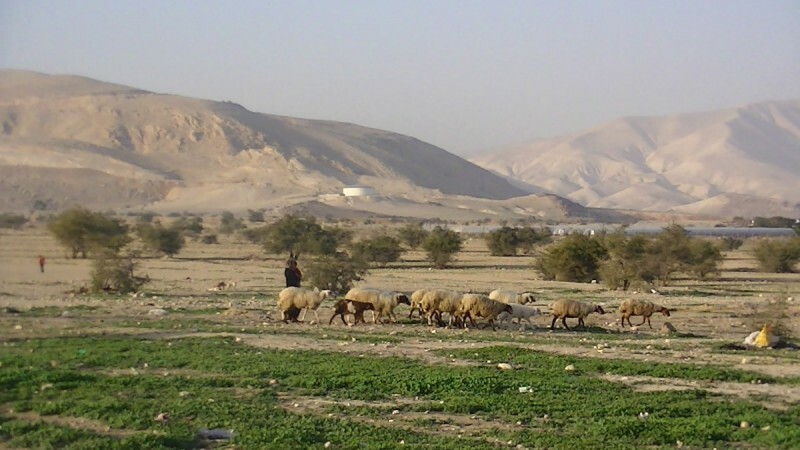 Palestinians in the Jordan Valley also face regular harassment from settlers and soldiers, whether it be violence, theft, abuse, or the destruction of crops. “My family [has] goats and sheep,” says Hasan. “If we are as little as 100 metres from the settlement fence, the soldiers come and shoot to scare our sheep. Sometimes the soldiers kidnap us shepherds and the sheep escape everywhere.” He says that shepherds have been detained by soldiers and not released to retrieve their sheep for several hours. Israeli settlement expansion in the Jordan Valley is driven by Zionist colonialism, but another motivation is that there is big money to be made by Israeli companies in exploiting cheap Palestinian labour. The unemployment rate in Gaza and the West Bank is the highest in the world – according to the International Labour Organization (ILO), it was 27.4 per cent in 2017. With agricultural livelihoods under attack and freedom of movement massively restricted by the occupation, many Palestinians across the West Bank are forced to work in the settlements on land stolen from their families. Over 130,000 Palestinians worked in Israel and the settlements in 2017. Khaled, Yousef, Samih, and Hasan all work long, hard hours, seven days a week. They get paid NIS 100.00 a day ($36 CAD), which includes the NIS 10.00 fare for the bus to work. The daily Israeli minimum wage for a six-day week, which Palestinians working in Israeli settlements are entitled to, is NIS 212.00 ($76 CAD). For Yousef, Samih, and Hasan, there is no sick pay. Khaled is the only worker interviewed who thinks that his employers give sick pay when there are accidents. He explains that one worker had his hand broken by a machine in the field, and was paid while he recovered at home. This is a lucrative business for the settlement companies exporting fruit and vegetables to be sold around the world. 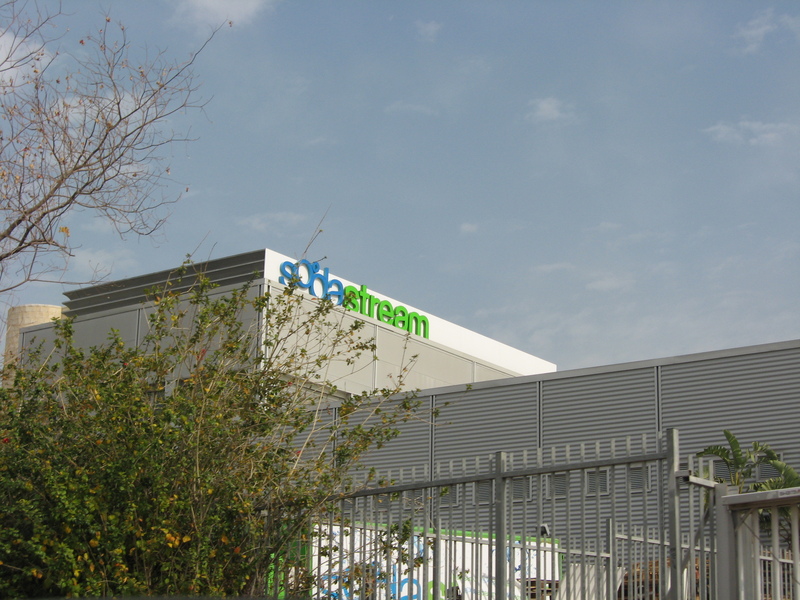 These products are often labelled as “made in Israel” to disguise that they came from settlements on Palestinian land – although in 2015, the European Union mandated that Israeli producers must explicitly label farm goods and other products that come from settlements built on occupied land. In 2005, 170 Palestinian civil society organizations came together to call for boycotts, divestment, and sanctions (BDS) against Israel. The boycott covers Israeli goods (including those produced in settlements), companies, and institutions. Pro-Israeli state and Zionist propaganda paints these activists as extremists and anti-Semites, simply for putting pressure on the Israeli state to end Palestinian oppression. The Knesset, the national legislature of Israel, has made it a civil offence to publicly call for a boycott against the state of Israel. In early 2018 the government published a list of 20 NGOs whose officials would be banned from entering the country – including representatives from BDS national committees in France, South Africa, Italy, and Chile. The unemployment rate in Gaza and the West Bank is the highest in the world. Canada, however, has a long history of siding with the Israeli state instead of with Palestinian human rights. In 2016, the Canadian Parliament passed a motion formally condemning the BDS movement. Later that year, Conservatives and Liberals introduced a bill in the Ontario legislature that, if successful, would have imposed economic sanctions on several Canadian organizations that support BDS. Luckily the bill was voted down by a wide margin. Undaunted, Canadians for Justice and Peace in the Middle East (CJPME) and other groups are campaigning in support of the boycott. CJPME distributes stickers that proclaim “Israeli apartheid: Don’t buy into it” for consumers to stick on Israeli products at their local supermarkets. Later in 2016, the Canadian Green Party voted to adopt BDS as part of its policy. Goods from Tomer, where the boys work, are exported all over the world. In the past, BDS activists have uncovered that dates packaged in the settlement had ended up on the shelves of major European supermarkets such as Morrisons and Tesco. Several products from the occupied Jordan Valley, such as medjool dates and herbs, are air-freighted for sale in the U.S. and Canada. Shoal Collective researchers visited Tomer earlier this year and found that boxes of capsicum were being placed in packaging bearing the logo of Israeli company Arava, the leading exporter of capsicum from Israel and its settlements. 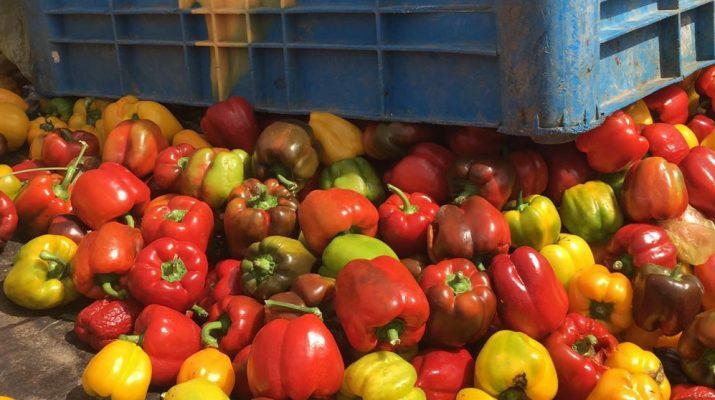 Arava U.S.A. was set up to export capsicum and other fresh produce to the U.S. and Canada. We also photographed products being packaged for export by Israeli settlement exporters Cheriessa and Danny Maimon, being packaged inside Tomer. It’s high time that Canadian supermarkets and grocery stores follow suit, stand in solidarity with oppressed Palestinians, and join the boycott of Israeli goods. *Names have been changed to protect the security and privacy of workers.